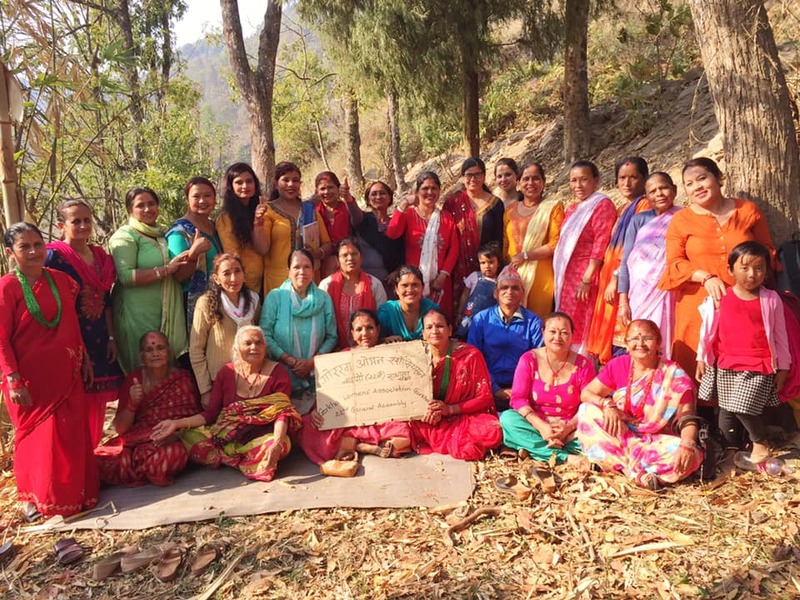 A wonderful general assembly for the Gorkha Women’s Association (GWA) in Raniban, Gorkha. A lovely programme with cooking in the forest, dancing and a meeting to discuss this years programmes. 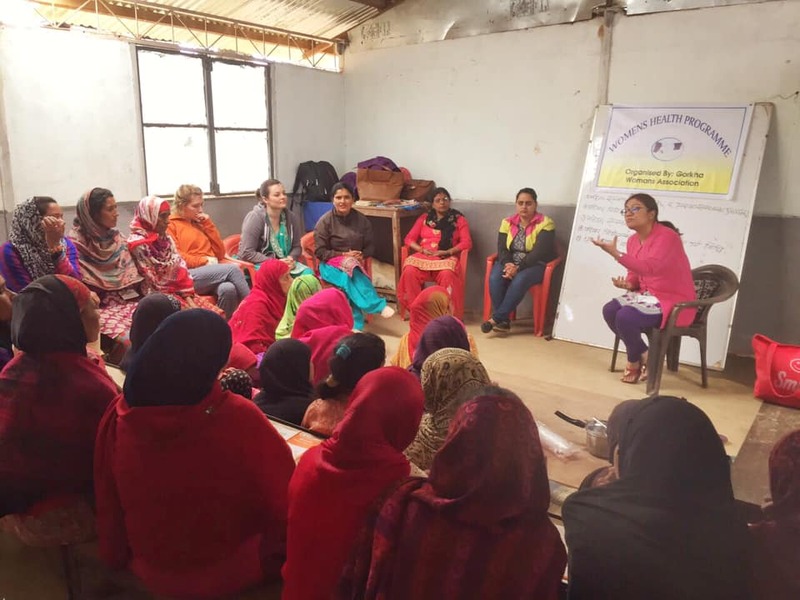 Lots of good ideas from the women for what they would like to do in the future to include womens health programmes and childrens hygiene, both projects funded by GDS. Many beautiful colours and people! 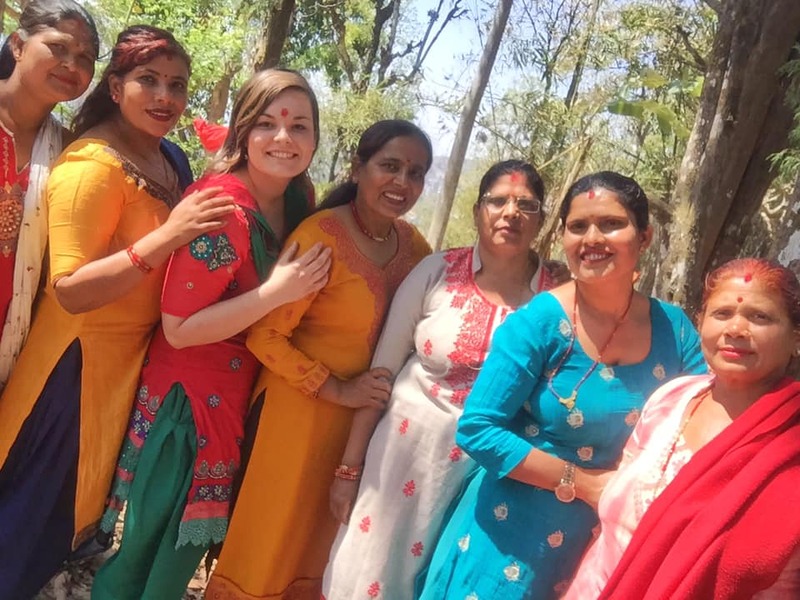 This entry was posted in News, Updates, Volunteer News on April 11, 2019 by Lin. 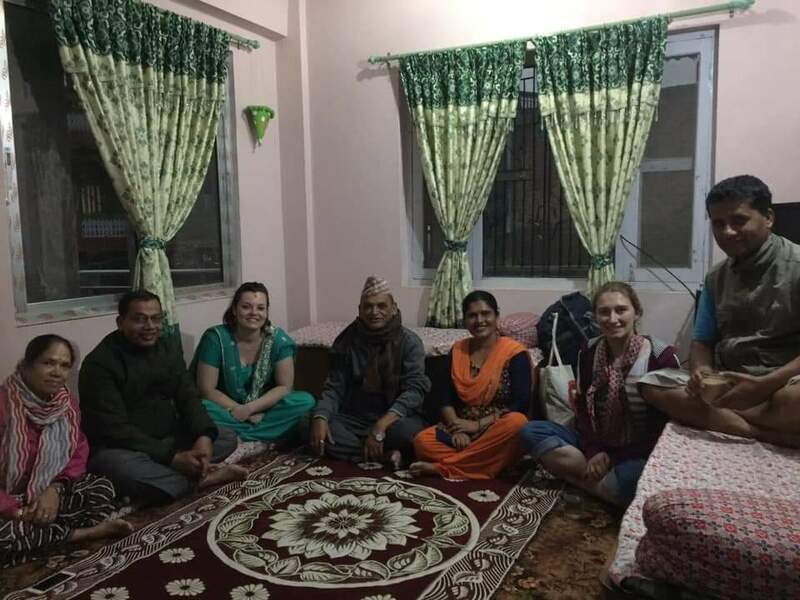 Rebecca Bowen was welcomed by our committee in Gorkha and also her lovely homestay family as she arrived for Medical Elective placement this week. 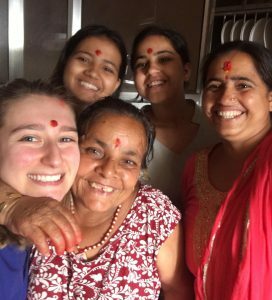 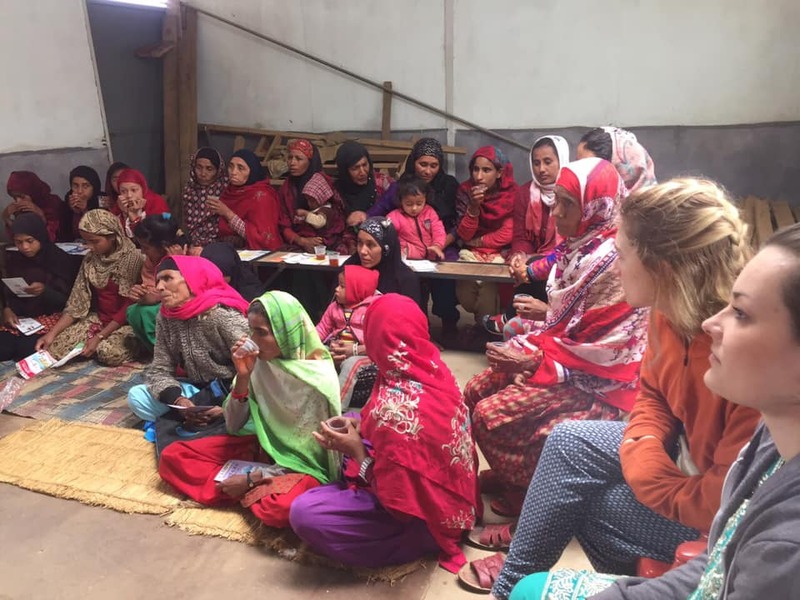 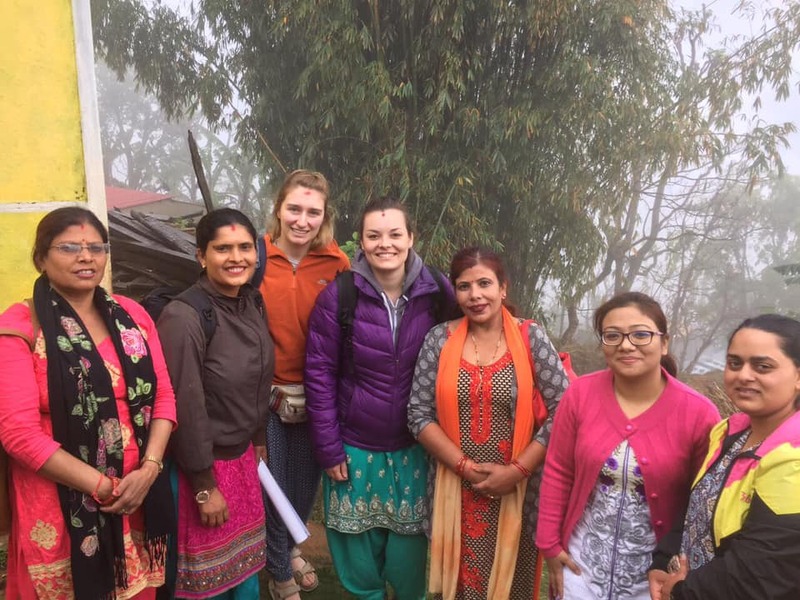 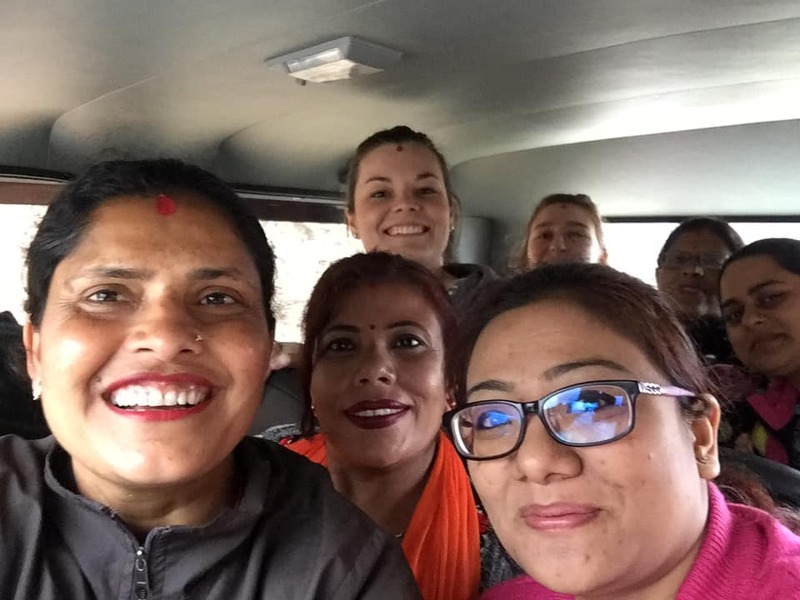 Rebecca from Bristol University is seeing the warmth and hospitality of the Nepali people and is spending time with Naomi and Dr Anju at the hospital and looking forward to a womens hygiene programme being organised for rural women on Saturday. 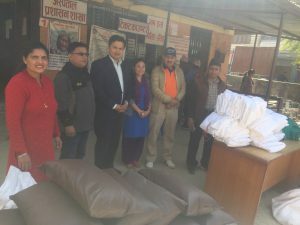 This entry was posted in News, Updates, Volunteer News on April 4, 2019 by Lin. 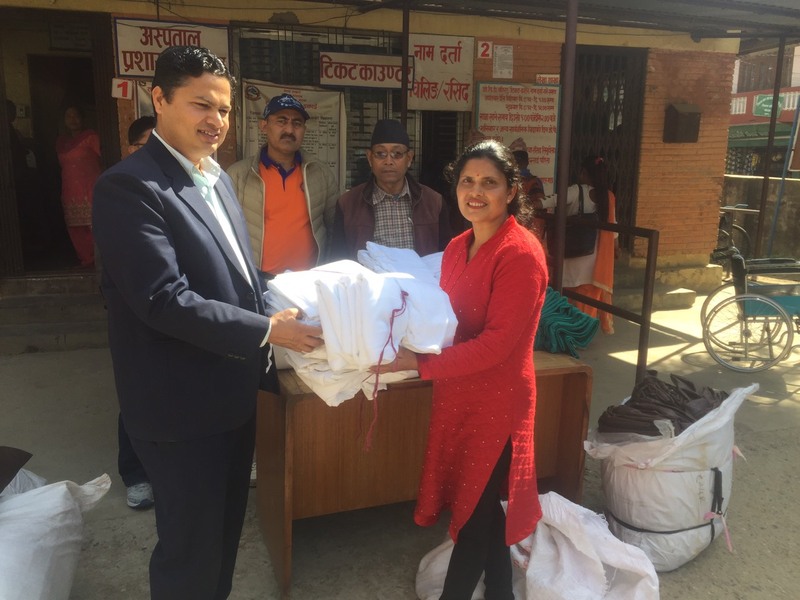 On Linda’s visit to Gorkha in December, requests were made by the hospital to fund materials for the hospital beds. 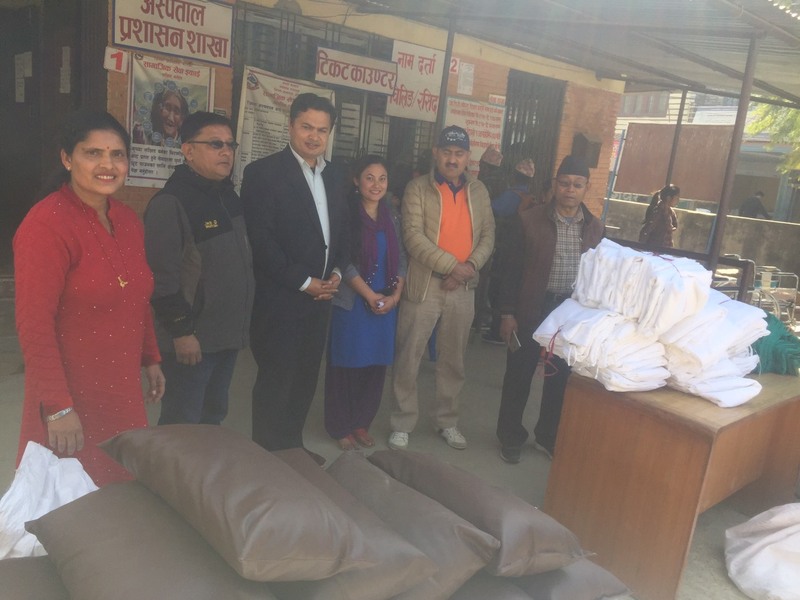 An inventory of the 50 beds was made and mattresses were recovered or new ones purchased, pillows bought for each bed and sheets bought so that patients don’t have to lie on the plastic mattress covers – too cold in winter and too hot in summer. 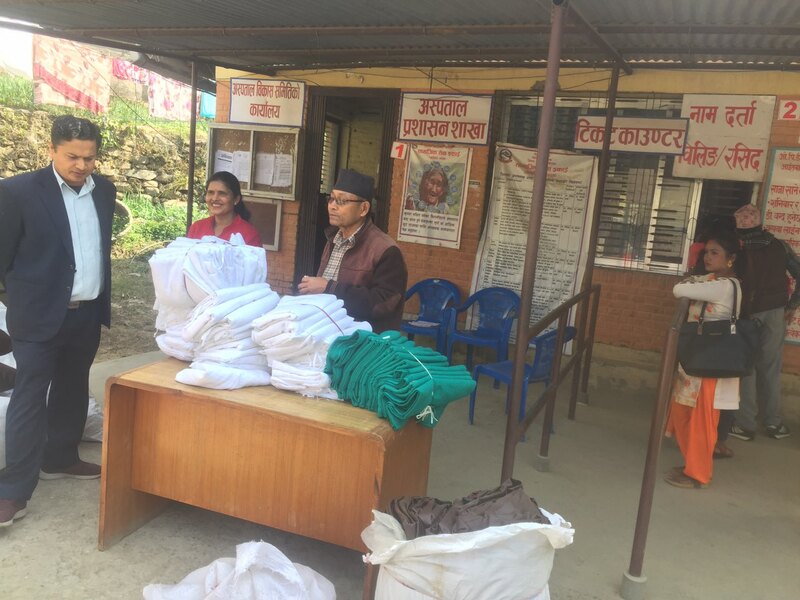 It might seem basic, but these simple purchases will give a little comfort to every patient. 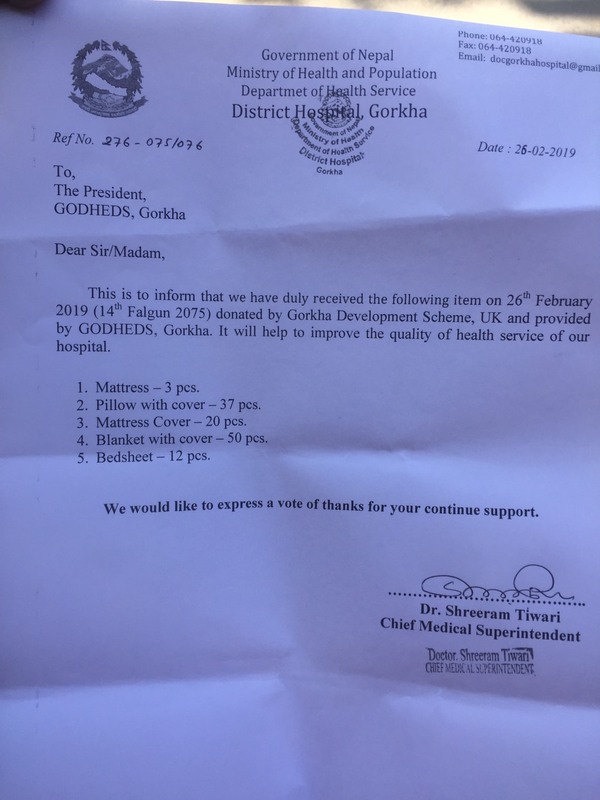 GDHEDS committee members recently made the presentation to the hospital and a letter of thanks has been received from Chief Medical Superintendent Dr Tiwari. 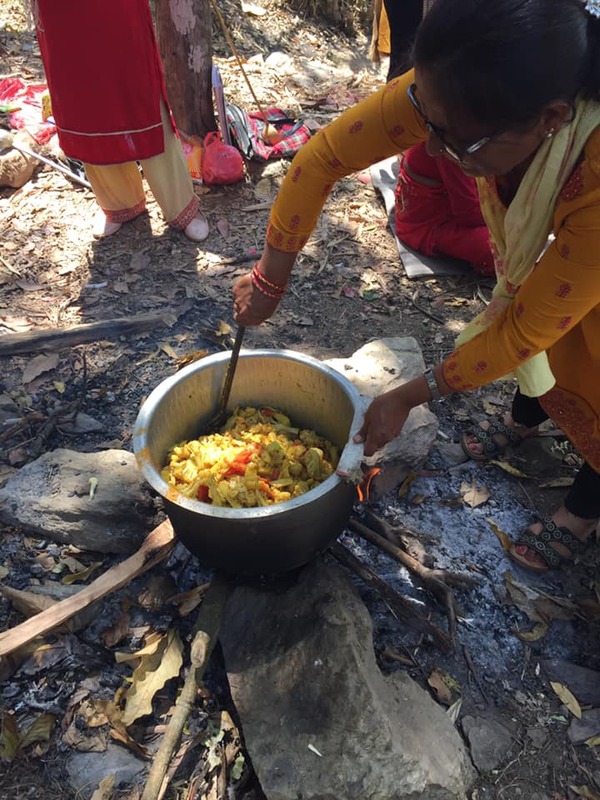 This entry was posted in News, Updates, Volunteer News on March 19, 2019 by Lin. Medical student Eamonn spent one month in Gorkha last summer on Elective Placement in Gorkha hospital and living with a local family. As a show of support for the kindness shown by the people of Gorkha, family members and notably Lady Ann Hair Salon in Gosport, Hampshire. £200 was raised and as we have just funded sheets, pillows and mattresses at the hospital, then this money is already used in the hospital where Eamonn spent his time. 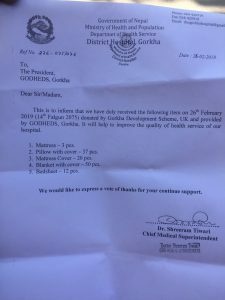 We wish him well as he concludes his studies to qualify as a Doctor. This entry was posted in News, Updates, Volunteer News on March 11, 2019 by Lin.